Version control lies at the very core of Continuous Integration. 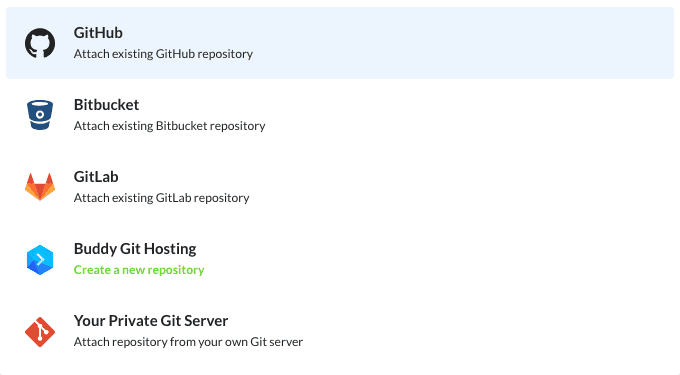 Buddy integrates with all popular Git hosting services, including GitHub, Bitbucket, GitLab, as well as custom repos on private servers. You can also host code directly on Buddy if you like to keep everything in one place. You can easily add any type of repository via Buddy’s GUI (see above). However, some developers prefer to automate it via the API, especially if they worked out a template to follow. Let’s say you’re a digital agency and just closed a deal for a series of websites. A typical use case begins with the team leader setting up a new project in the task manager. With proper CI/CD applied, the project then automatically creates a new repository on the code provider (e.g. GitHub), and uses the Buddy’s API to set up the CI: integrate the repository, create pipelines, and so on. Until now, adding new projects via the API was only possible with repositories hosted on Buddy. With this week’s release, we have added support for all integrated Git providers, and custom Git repositories.